Crucial in scrum is to choose your team well (multidisciplinary!). Scrum can help (the product owner and scrum master) to chose the right team. To make it tick between the members of your scrum team you need to work on the team spirit. LSP can be very well used to work on this, e.g. by having team members build their own strengths (and weaknesses), or work with them on e.g. what team spirit means to them, what working together effectively means to them, etc. It is great to define simple guiding principles together. In scrum you work with user stories (IT) and project stories (non-IT). LSP can be used to define good and broad-based stories. LSP can be used to make an overview of the stakeholders that matter to your project, and how they are connected, or what the environment you are working in looks like. In scrum you define the ambitions for your project. This can be very well done using LSP. LSP can also be used for defining the items in your product backlog. Make the team build everything they think is needed to be done to achieve the goals you have set. Is there a lot of discussion on the Definition of Done? Use LSP. LSP can also be applied for doing effective retrospectives and futurespectives with your team. Use assignments like: build a nightmare sprint, or an ideal sprint and how to realize such a sprint. In IT LSP can be a nice way to handle more emotional subjects (instead of addressing them directly). Essential to scrum is to involve your stakeholders. Instead of interviewing them, LSP can be used as a method for qualitative research. Results of such sessions (the models itself or a movie made of a shared model/system etc. of the accompanying story) can be very well used during reviews. Do you want to finish your project in a different way by looking back on the project? Use LSP to evaluate. During workshops and training sessions LSP can be used to explain how scrum works and what its take aways are. Sounds great doesn’t it? So, act like in scrum and don’t keep thinking about how to apply LSP in scrum, but just start en learn by doing. The first step to take is to do the skills building at the start of your project, so you can easily apply it when you find it useful to do so during the process. Still, LSP – of course – is not always applicable. So: choose wisely when to use LSP, it has to be in line with the ambitions you have, and add to fun, depth and/or efficiency. Don’t let it become a distraction and beware of it taking too much time. The above list shows the many possibilities of using LSP in scrum. 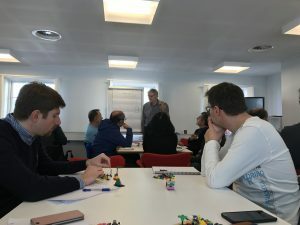 During the session in Billund in October 2017 we did not have the time to work out the many possibilities in depth. Have you used LSP during a scrum project? I would love to share experiences!